Google may or may not being making us stupid, but it does appear to render human memory obsolete. By now most of us have probably heard someone suggest that with Google functioning as our reliable and ubiuqitous prosthetic memory, it is no longer necessary to waste time or mental effort memorizing facts. This is usually taken to be a positive development since our brains are now assumed to be free from the menial work of remembering to do the more serious work of creative and critical thinking. This sounds plausible enough and gains a certain credence from our own experience. Some time ago we began noticing that we no longer know anyone’s phone number. We’re doing well if we can remember our own. Ever since cell phones started storing numbers, we stopped remembering them. And for the most part we’re no worse for it, except, of course, for those instances when we need someone’s number but we can’t access our phones for whatever reason. But those situations tend to be few and far between and on the whole we have little reason to begin memorizing all the numbers in our directories. We should, however, think twice about extending that line of reasoning much beyond phone numbers. 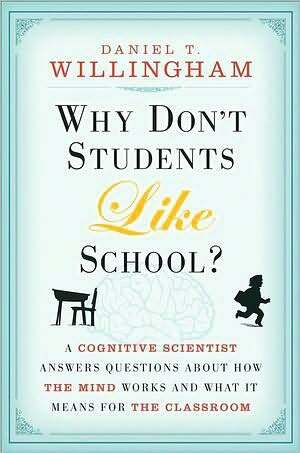 In his 2009 book, Why Don’t Students Like School, Daniel Willingham, a cognitive scientist at the University of Virginia challenges this popular line of reasoning and argues instead for the importance of storing factual knowledge in our long term memory. There is a great danger in the present day lest science-teaching should degenerate into the accumulation of disconnected facts and unexplained formulae, which burden the memory without cultivating the understanding. b. Chunking facilitated by available knowledge in long term memory enhances reasoning as well as reading comprehension. 1. “Shallow knowledge is better than no knowledge”: You can’t have deep knowledge about everything, but shallow knowledge of some areas, while not ideal, is better than nothing. It’s at least something to build on and work with. 2. “Do whatever you can to get kids to read”: In Willingham’s view, nothing helps build a wide knowledge base better than reading and lots of it. 3. “Knowledge must be meaningful”: Memorizing random lists of disconnected facts is not only harder, but ultimately less helpful. That last point acknowledges that mere rote memorization and incessant drilling can be fruitless and counterproductive. Of course, that much should be obvious. What is no longer obvious, and what Willingham compellingly demonstrates, is that storing up factual knowledge in long term memory is not the enemy of thought, but rather its necessary precondition. It would appear that the rhetoric of offloaded memory ignores the findings of cognitive science and leads to ineffective educational practice. Related posts: Offloaded Memory and Its Discontents and The Fog of Life. So why do my parents always try and stop me reading? I mean, a book a day’s only reasonable, isn’t it? I agree with you on the argument of cultivating critical thinking as well as building up on meaningful factual knowledge as the right way to education. As you made the analogy with computers, without facts, we are mere processors, but we already have machines to do that job for us. I personally love reading and collecting facts about anything I come across, whether its just to impress others or to actually use them in real life, for me, my continuous personal education is incomplete without them. Right, that was an important take away for me from Willingham’s perspective, we shouldn’t think of thinking as mere or naked processing. Interesting perspective here. I’ve noticed revolutionary/controversial ideas coming from my daughter’s elementary school, which now has a “no homework” policy (*gasp! *) AND doesn’t teach to a spelling or vocabulary list (*double gasp!*). Without enough evidence either way, I’m just not sure about my thoughts on the outcome of this. It seems that some rote memorization is important in life, as we don’t always have access to computers/calculators/Google. But I can also see the argument that mindless “busy work” doesn’t necessarily correlate to higher outcomes. I’m definitely in favor of teaching students spelling AND vocabulary. I have a young niece who sends me e-mails that are LITTERED with misspellings (very scary ones, at that) and I marvel that she went to the same elementary and junior high that I attended when I was her age. Clearly something is going awry if there are kids who are progressing through the school system with passing grades and yet they can’t string their thoughts together cohesively. I feel the internet and computers in general should be treated as a learning tool, but they should not replace the traditional gathering of facts and the very act of formulating ones own ideas and arguments. Besides, I think we’d be blind not to acknowledge the very distracting, attention span-shrinking effect that overuse of computers and electronics has on everyone — not only students. I’m pretty sure Einstein once said that you shouldn’t memorize anything that you can look up. But I’m not sure. You’ll have to Google it. No need, he did. In fact, Willingham mentions Einstein and uses him as a foil for his position. 1) Einstein did not have google! 2) to look up something can also mean to look into journals and technical articles and text books related to the field/topic in question, and not necessarily any one of the n-thousand hits that one gets upon typing something into google. That would require knowing the topic and its related components before searching google i suppose. Great post! I have always found gathering facts and resources to be fun… call me crazy… I did major in English and though critical thinking was stressed in our formal and informal responses (in opposition to banal regurgitation of the material) that thinking was always grounded in tangible evidence. It was a bit scary being a teacher’s assistant for a high school level summer program and seeing how little interest some students had toward learning anything. They couldn’t even get through Fahrenheit 451! I enjoyed it immensely having never read it and skipped ahead of the reading schedule because I had to finish it! Most students clearly didn’t try and most didn’t finish and here I was supervising their classes and activities and had more than enough time. They were anything but concerned for a world with no books. Kids don’t have to read books anymore and if they do they just go online or find some way to cheat if they want. They’ve mostly outsmarted their teachers or the teachers have given in because it’s such a struggle. Books are not valued in our society and neither is being knowledgeable. However, having the latest gadget that can look up any useless fact is extremely desirable. I could see if the content was completely boring, hey, I’ve had to read a few bad books myself… but when it is such a good read you have to wonder. This program was supposed to be for kids who were: from an economically challenged background, part of a minority group or the first in their family to consider going to college so these were not necessarily challenged kids. Having outed them for their lack of reading skills I will say that a few did posses a want to learn and listen and many of the others just lacked structure or inspiration of any kind. They are not expected to do well so they won’t and it won’t matter to anyone but themselves if they continue believing that lie. I went through the same program for four years and I was top of the class, especially when it came to reading. We read Things Fall Apart when I was entering into the 9th grade and I’m pretty sure only a few of us finished… I went on to graduate an A/B student at the same school the program is hosted. I won’t lie and say I read everything that was assigned in college but with thousands of pages to read plus pages of papers due per week with a part time job who could? My focus will always be in gathering useful information and formulating my own interpretation: the foundation for learning! Thanks, and thanks for taking the time to comment at length. There certainly are many challenges facing teachers and students alike, and at times reading seems to be on the decline. Some recent studies, however, have suggested that declines in reading have slowed and in some cases gains have been made. Certainly part of the solution is the determination of teachers who will challenge students to transcend the narratives of limitation that have been imposed on them. And, yes, reading everything assigned is sometimes just beyond the realm of the possible, as a grad student I’m keenly aware of that! Excellent post! I majored in Cognitive Science and in fact my area of study is on memory. Reading this post was deja vu as I had written something similar to this a few days ago. Memory is a fascinating topic. It might end up being the focus of my research. This post appeared at the right time! I’ve been collecting my thoughts to compose a post on a complex idea in layman’s terms…I may have to quote you! For me this statement is loaded. Some live their lives with this as their mantra, but forget about the “build on and work with” part. Our job as parents and friends is to keep urging those around us to continue “building on and working with” our knowledge. The mind (and body) is being challenged less and less these days, as you’ve pointed out. Promises of an easier world, for our body and mind to do less is not the answer. Luckily we won’t need to wait around for another fifty years to see the damage, it is happening now, before our eyes. Be thankful the human system can restore itself quite quickly when given the right kind of attention. This is so true, I find myself doing this all the time. You might want to check the color of the font here: J. D. Everett who in 1873 warned that…It is almost invisible. Thanks, this is a relatively recent template for me. The inset quotes do come out pretty light, I’ll see if there is anything I can do about that. Great post. Facts and thinking are both vital and depend on one another. Google is still a useful tool to add to you knowledge base or jog your memory, but if there’s little or nothing memorized in the first place, it won’t help much. Interesting insights into a conversation that seems to be popping up a lot lately. I wonder if Trivial Pursuit has a future? interesting to see psychological research in future, has been a subtle convergence of memory and IQ, >big memory=big IQ , will the link evaporate because of the internet? Awesome post, I could go over and over with this conversation. Congrats on your Freshly Pressed. i have taken a cognitive science-related subject during my university and liked it very much. a surprise to read this here and i learn much from this post. Great post, and really interesting. I went to school back in Europe, in Hungary, where even when I was a kid (not all that long ago), strict Prussian methods were still in favor… Sometimes we were up till midnight or later to finish our homework, we had to read and process (in lengthy book report) 1-2 books EACH break (summer and winter) and I know for sure that by 6th grade I had memorized over 100 poems! I may have no more use to all the knowledge they crammed into our heads, and I may not even remember everything – but it taught us how to learn. But anymore, we are facing a similar trend, too. Several subjects are facing cuts in hours and years taught and in curriculum, yet the time spent in school is supposed to be longer. I was a straight A student in elementary, then a mostly-A in high (ending up graduating A+), and along that I had the time and chance to pursue my interests in arts, journalism and become an internationally competing fencer. Yeah, I needed to learn time management early – but isn’t that a skill highly sought after by recruiters? Now, I also encourage teaching how to use Google as a resource – just as it should be taught how to navigate the decimals in a library! I think of Google as a global library catalog at my fingertips – and when I found what I need, I can just go down to the library and do my research quicker. But if you don’t know how to learn, to understand what you read, to be able to jot down the gist of it…. what’s this world is going to get down to? As much as I dreaded a world without cursive (great article on it here: http://seattleseconds.wordpress.com/2011/07/09/is-cursive-obsolete/), I’m scared of a world without books. I think I’ll just start hoarding them right now. Finally I completely agree that the greatest gift you can give a child is the love of reading. That is one of the biggest differences in my students…those who love to read and those who don’t. Vocabulary, critical thinking, creativity, culture, attention spans are all more advanced compared to their counterparts who are usually more into video games and (ironically) internet activities. Its an interesting argument and I think worth a larger discussion in our education world. Congrats on making Freshly Pressed and an inspiring post! I’m familiar with the classical model, and I do think it has a lot to offer. Not least of which is the place it gives to the importance of memory, but then also insisting that students progress from grammar to dialectic and rhetoric. My experience with students is similar, readers definitely tend to have an advantage in the areas you listed. And it seems to me that even when speaking with adults one can pick up after a while whether someone is reader or not. Very informative post. So much interesting concepts. Amazing. Thanks, you’ve put it so well. I’m going to get my son to read this. Once I ‘grew up’ I realized that my education seemed to be lots of skimming the surface without much depth. I have spent the rest of my life trying to dig deeper and make it stick in my head! The internet is great for fact collecting, but you have to actually absorb the information not just look at it! At the primary school my kids both attend computers are used daily for work, but they are expected to use their brains first and foremost, to actually know ‘stuff’. If you don’t know this ‘stuff’ how can you hold up your end of a discussion about anything? I can’t remember phone numbers anymore either, I was blaming it on premature aging. Now, thanks to you, I will blame it on my less than stellar schooling! Great post and congrats on being fresh pressed. I find you post so useful for Chinese students and reforming Chinese exam-oriented educational system. Therefore, I have translated your post into Chinese. Hope you don’t mind and thanks again for your wonderful post. Not at all, glad you found it useful! The value of the Internet is : it is a readily accessible facts for short term memories unless acted up with critical thinking. I myself use the internet to search in forums for ideas in my interest such as mountaineering, camping, cooking and running. Though popping a question in forums or boards isn’t really that interactive. Internet is like reading a book, listening to a neighbor’s or a relative’s story, or if i a may say so, evesdropping on a conversation. The means to getting facts changed but the facts remain the same. Also the source of the information is also crucial and relevant. BTW, love the post. Congratulations on being Freshly Pressed. How about Extended Mind Theory, where external objects (outside of our bodies) are considered an extension of our mind? Like the thought-experiment of Otto, who has Alzheimer’s. He has a notebook to keep information, which acts as his “memory”. So, Otto “knows” things (like directions to the museum, for example) by using his notebook – compared to others who can recall the information from their own memory. This seems kind of similar to the idea that Google may be an extension of our mind…. I’m a bit sceptical about this one though, can’t seem to make my mind up. Also, I agree that we’ve become lazy in not trying to remember as much information as we used to, but that doesn’t mean that we have become complete couch potatoes – doctors, for example, must remember a ridiculous amount of information! Perhaps the smartphones help us out in the long-run! I can go with the Extended Mind Theory to an extent. Andy Clark, et al make a good case for the ways in which we think with our environment and I’ve written on here before about instances of embodied knowledge and social remembering. But I think it is important that we make distinctions among the things we are remembering. So directions to the museum, for example, is an instance of procedural knowledge. You do one thing with it — get to the museum — and you’re not necessarily trying to think deeply or creatively about that one thing. So as far as it goes, it’s adequate. For other types of mental tasks that require analysis, synthesis, evaluation, judgment, creativity, I’m inclined to think that internalized memory/knowledge is necessary. So I wouldn’t claim all outsourcing of knowledge is problematic, but I do take issue with the rhetoric that denigrates all forms of knowledge as memory, or knowledge for facts as superfluous in the age of the Internet. Hope that makes some sense. The Rockefeller’s founded the National Education Association….. Go figure. Even though research shows that certain things are important or work better than others, it seems as if that knowledge takes an enormous time to find its way to schoolteachers. Research on learning a foreign language has shown for several decades that memorizing pure vocabulary lists is a waste of time. The students still don´t know how to use the words they have memorized and if you move around the words and put them in a different order they don´t remember almost any words. Still so many foreign language teachers keep giving vocabulary lists as homework and do not require the children to use these words in sentences. Learning without meaning or a useful context does not help much. The human brain is also not developed enough at a certain age to understand different grammar structures which could explain why children can´t apply the grammar rhymes they spend hour on memorizing until many years later. Memorizing is good but exactly what and how one has to store things in memory should be combined with research findings to maximize the effects! Thank you for sharing some new research on this matter. There is certainly a gap between current research and pedagogical practice. In most disciplines their tends to be a similar gap as well. It takes a while for research to filter down and get translated into practice. Willingham’s book on the whole is very useful precisely for the way in which it condenses a good deal of research into some very practical implications for the classroom. Great article. May I quote and link to parts of your article relevant to my article on early math education (http://lightalamp.wordpress.com/2011/09/20/my-experiences-with-early-math-education/)? I have observed first hand that math education (especially) becomes very challenging without the memory of raw experience with numbers. I tell my wife and students to “google” it if they don’t know. It is a test of research. Whether they read it and remember it… that remains to be the issue at hand. The only way to improve reading speed and comprehension is to just do it a lot. Thank you for your thoughts in this blog. My experience as a (former) senior high school English teacher is that students, aged 16-17 years, do not know how to memorise information and therefore have great trouble synthesising ideas into cogent discussion. They use the internet to copy and paste, the computer to write poorly crafted draft essays, and read very little, making for limited human brain work. I have just read Dorothy Sayers’ paper “The Lost Tools of Learning” which makes some sense. I empathised with her lament for the state of education and its product. Sayers’ essay is very good and I think she makes some excellent points. Surprisingly for an essay written in the middle of the last century and about medieval education, it remains remarkably relevant. Having skipped out on the grammar stage of mastering basic information, students have a hard time moving on to the more complex mental tasks we want them to preform. By the time kids are 16-17, it is too late for them to get into the habit of memorizing. If memorizing was a pleasure and was encouraged at the right stage, then they will continue to do it throughout their lives without any extra effort. However, if it was not emphasized at the right stage, they will have ongoing problems. As the above article says, having at least some imperfect knowledge is better than nothing ….. at least they may realize and put some efforts (it will have to be quite a bit of effort if it is not done at the right time) in the right direction. But the environment discourages rote learning without understanding how and when to do it. One cannot blindly embrace rote learning for its own sake, nor can we categorically denounce it. Both these extremes have been done to detrimental ends. I had formerly taught at higher education institutions and have seen first hand how unprepared students are. They come in seeking an easy way out – just teach me how to use this software, forget about the details of how it works! This is at some very good institutions! Now, having young children of my own, I focus more on early education and I am very careful about how I help them and their friends. The biggest problem I see with public schools is passing the buck (students). In elementary school, each teacher copes for a year with the class – then their responsibility is over. Of course they are doing what they have been told to do with little resources and huge class sizes and with a segment of very disruptive children. So they end up focusing on bringing up the “problem children” because that’s where their evaluations suffer (their averages have to be maintained). The problem children remain problem children for the most part and the regular children are pulled down. If parents cannot or will not focus on their own children, then they end up playing russian roulette with public schools. At the middle and high school levels, teachers just lay down the rules. You follow step1, step2, and step3, the problem will be solved and you will get a good score. Forget about why you have to do what you have to do. I agree that there are good teachers and not-so-good teachers everywhere. However the environment pulls down the good teachers to the extent they are rendered incapable of performing. Many get frustrated and leave if they can. Otherwise they have to plod along with their wings clipped. What is the solution? I think it may be in grouping children, teachers, and parents with similar aptitudes and outlooks. Such groups should work together at the grass roots level to cater to their childrens’ continuous overall development. So the same group of teachers and parents, who have a vested interest in the child, are responsible for the child through his K-12. The child sees the same faces, hears the same values, and learns accordingly. No confusion. Right now such a concept is being adopted ad hoc by home schoolers. It is daunting to homeschool your kid without institutional support. That is why home schooling has been successful mostly in the Christian community with the support of their churches. It would be most beneficial if such a system is formalized so that it is available to all and sundry. Then whoever wants to join a group has to get with the group and put in their effort or opt out. Too many distractions. And hormones. I expect that many folks in the near future won’t be able to reach office without GPS. At least locations they visit less frequently. Human mind can learn only so much in a given period of time. We have evolved to understand it is best to learn most efficient means to perform tasks. Why waste time with trivia when Wolfram Alpha does so at lightening speed. Well, what counts for trivia is relative. As I’ve noted in another post, the details of the cardiovascular system may be trivia for me, but not for the surgeon in the middle of open-heart surgery. In general, I believe Willingham makes a good case for internalizing some knowledge for the reasons noted above. True. However, I believe most individuals exhibit selective memory loss. They have a tendency to forget or overlook data that they don’t require to do their job. A surgeon definitely does not refer to google or some gadget every time he/she needs to visualize human anatomy. But same person may well be terrible when asked for his best friend’s cell phone number. Agreed. No one is going to keep everything in memory, of course. My main objection is to the rhetoric that diminishes memorization and storing up knowledge altogether simply because it may be easily available externally. External memory does not equal internal memory without remainder. Some good points there for buddings authors methinks. Great post! Is it ok if I like this to the blog I am starting? As a high school educator I constantly struggle with the issue of how to help students understand the value of critical thinking and this just reminded me of the importance of being able to conceptualize before we analyze. Although I agree that technology affords us opportunity to not invest time or ‘space’ for rote memorization, general knowledge is the underlying springboard from which we propel ourselves into a deeper understanding. I find this most often to be true when teaching literature and students incapability to perceive nuances and allusions in the text. Without knowing and memorizing such things, the conversations stay at that surface level and students are not able to connect personally or academically with the intentions of the text. Although there would be push back on the idea of an increase in the efficiency of man-kind, if I look at this merely from an teachers perspective and how it influences the students in my classroom, their experience as a generation that has always had ‘google’ can account for some of the gaps in information that students know no other way to fill. Yes, feel free to link. I’m glad you found it helpful. Best wishes with your teaching! I was really impressed with the depth of thought in this post. As an Educator, I always think of these issues and problems with the learning process.